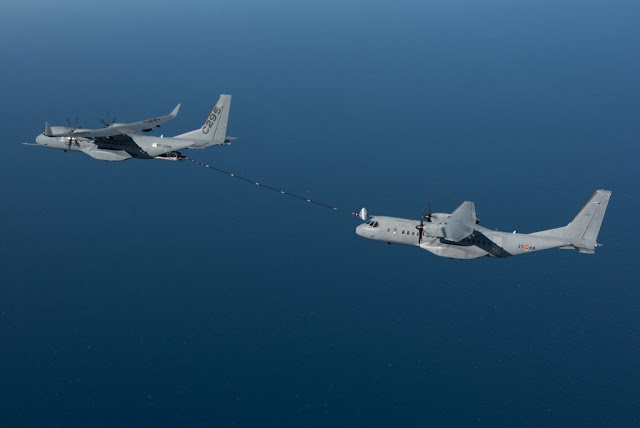 Airbus Defence and Space has successfully demonstrated the Airbus C295W medium transport as an airborne tanker. The C295W, equipped with a palletized air-to-air refuelling unit and associated computer control system, conducted multiple contacts with a standard Spanish Air Force C295 in a test flight on 29 September. Both crews reported extremely smooth operation at various speeds as low as 110kt. The system is intended for refuelling turboprop aircraft, helicopters, and eventually unmanned aerial vehicles. Possible applications include special operations and extending the range of search and rescue aircraft. Further trials with a helicopter receiver are planned before the end of the year.